To make this baked chicken, basically you only need two simple seasonings, salt and sand ginger powder, added the fragrance of star anise. Absolutely simple. 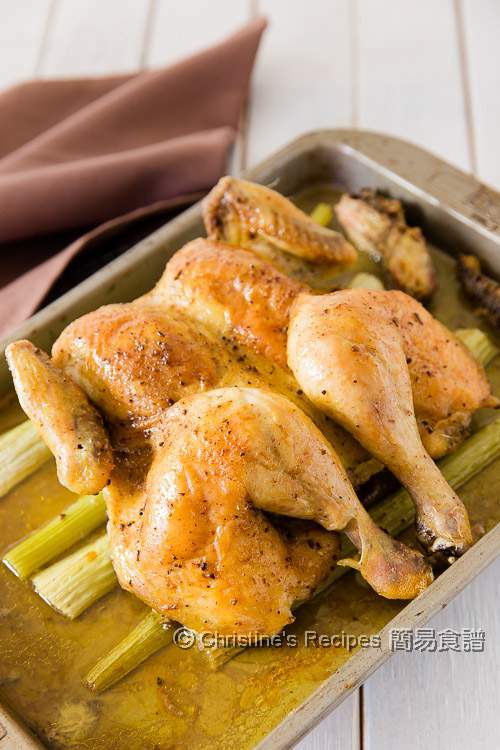 It doesn't need to take long, just an hour or so, you enjoy a fragrant and juicy baked chicken dish that you can't find anywhere else. 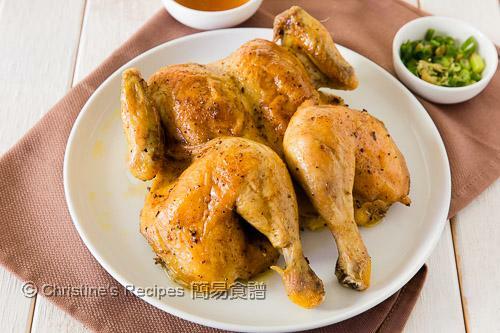 The chicken meat is moist and juicy. 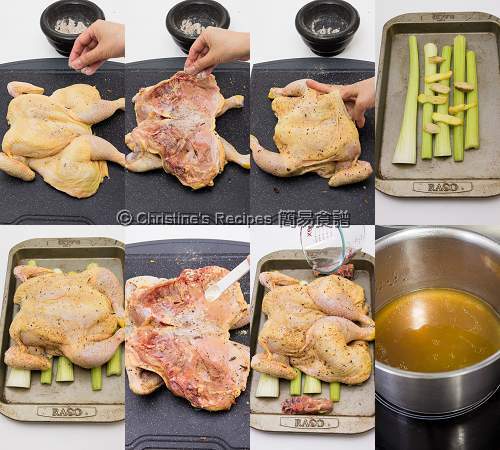 The chicken is butterflied and flattened before baking, so it’s easier to be cooked through. 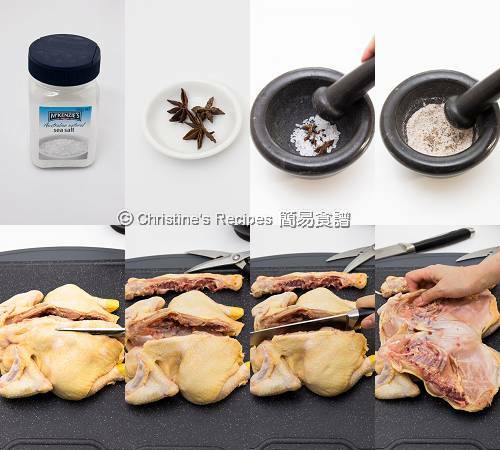 The browning of the chicken skin is more even as well. You don’t even bother turning the bird in the middle of baking process. Top left: sea salt and star anise. Bottom right: Make a cut on top of chicken's breast bone and flatten. After popping the marinated chicken into the oven, all you have to do is to wait. Keep in mind that every oven is very different and the temperature of each is not the same. When it comes to baking chicken, don’t leave it unattended towards the end, as you don’t want neither raw chicken nor over-cooked chicken. Rinse the chicken and pat dry with kitchen towel. Remove any large pieces of fat. Butterfly (also known as spatchcock) the chicken by cutting along both sides of the chicken’s backbone with a pair of kitchen shears, and flattening it out. You may make a shallow cut at the top of the chicken’s breast bone inside in order to help flatten the whole bird easily. Reserve the backbone for making stock later or bake with the chicken together to make dipping sauce. Pound the sea salt and star anise together. Evenly rub onto both sides of the chicken. Set aside for about 30 minutes. Preheat oven to 170C / 320F. Prepare a baking tray, lined with celery and ginger slices. Put in the backbone if desired. Sprinkle and rub the sand ginger powder on both sides of the chicken. Carefully place it on top of the celery and ginger. Pour in the water into the tray. Bake in the preheated oven for 60 minutes, or until juice runs out clear with an inserted needle into the thickest part. Let the chicken rest on a plate for 10 minutes. Don’t discard the liquid in the baking tray. It’s the most delicious juice from the chicken. Heat the whole tray on stove over medium heat. Reduce the juice by one-third. Discard the solids and spoon out the oil on the surface. Serve at the side of the roast chicken for dressing. It’s wonderfully tasty. Sand ginger powder, available at Asian grocers, is very different from ginger powder. 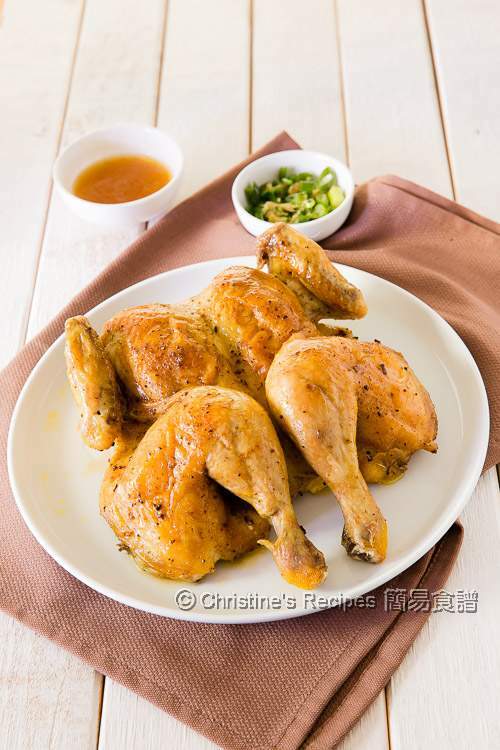 You might like to take a look at the picture on the previous steamed chicken with sand ginger powder recipe. You can put the star anise inside a plastic bag and pound with the back of a knife if you don’t have a mortar. I must give this a try! Love its beautiful golden colour. I went to a nearby Asian grocer to get sand ginger powder. Sorry, I discarded the packaging and put all the sand ginger powder into a glass jar. Forgot the brand. Any brand will do anyway. Iam not have celery ?can I make this chicken not use celery ? Of course, you can skip the celery. It's a dish for yourself as long as you like it. You might need to find another thing to lift up your chicken a bit while baking, like a wire rack. Can I use fresh sand ginger instead of powder? I haven't tested with fresh sand ginger. The benefit of using powder form is that you can marinate the chicken more evenly.